I’ve tried to stick with one word for each letter. It’s hard some days. Other people posting have given a list of words each day and I have enjoyed their lists. I try to wait until after I have written my post so as to not bogart their vocabulary words. And my intention was to write today’s post about my propensity to be negative and the original purpose of Realisa was a cognitive exercise to practice optimism and shift my perspective. I wanted to break a bad habit. I was (and at my core still am) an idealist and an optimist. Byt life has taught me to be a realist with a heavy slant towards cynicsm and skepticism. But after reading Chiot’s list for yesterday……Can I change my answer? I am a nerd, an absolute geek. I laugh at math jokes. I like the derivation of words. I am an eclectic reader. I have an encyclopedic memory and know a lot about a lot of things. Sometimes my peculiar knowledge of things and my quirky ability to make humor or commentary causes people to laugh and shake their heads. The jokes often take a moment to sink in because they are complex. A colleague has once joked that I was one allele off of being either a savant or autistic. And if you are a nerd, you get this comment. This is the street corner nerd equivalent of “Your Momma”. Don’t talk about my DNA! I like intelligent humor. I like clever, complex plot lines. I listen to the Sunday Puzzler with Will Short and shout the answers aloud. I like doing math problems. And an intelligent man is the most spectacular thing. 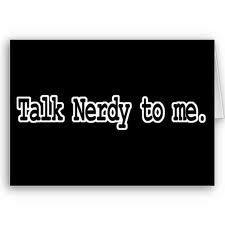 While eye candy is nice…..if a man can’t crawl into my head and appreciate all my nerdiness…I am just not interested.